I am back after a problem with our domain auto renew not renewing automatically. Do you ever feel as if your diet is getting repetitive? I thought I would share what Inday fixes for the children. She doesn’t do this because she doesn’t want to fix something different but it is a matter of finances. She fixes what she can afford from the weekly budget. A standard with each meal is rice. Occasionally when we are low on funds, she will make a soup with the rice to make it go further. Sharing an after school meal. If you have looked at the pictures, you will have seen the one burner camp type stove that she cooks on. That is why so many of the meals are soup. One meal is eggplant, bitter squash, malunggay (a very health-giving plant) and squash cooked together as a kind of 4 vegetable soup. Other times, she will fry bitter squash with egg. Another meal is made with boiling the water, then putting in some dried fish with a little onion salt, a bit of sugar and then adding sweet potato leaves. She uses the malunggay leaves to make a similar type of soup. Once a month, she will buy 3 or 4 lbs. of chicken so they can all have a little meat other than fish. 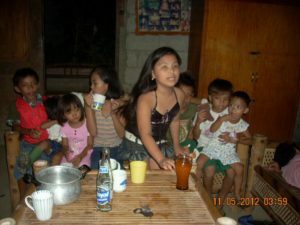 Yes, it seems the same day after day, but the children are happy to have the meals and never complain.